Lucknow: Next doors to UP chief minister's official residence - 5 Kalidas Marg, referred to as 5 KD in official parlance is another sprawling ministerial bungalow. This house is cursed. At least that is widely believed and as a result, most ministers refuse to occupy this bungalow. Thoe who do, pay the price. On Ram Navami on April 5, a special puja was organised in 6 Kalidas Marg bungalow after which Yogi cabinet's animal husbandry minister SP Singh Baghel entered this haunted house to live here. If employees of this house are to be believed, Baghel is the eighth occupant of this house. According to the Estate Department officials, Baghel himself offered to occupy this house, knowing fully well about its notorious reputation. A gardener who works here maintaining the impressive lawns of this house says that it is widely believed that whosoever occupies this house faces either political oblivion, career downslide or critical illness resulting in death. This house was occupied amongst others by Samajwadi Party leader Amar Singh, who is in the wilderness these days. Mayawati's right-hand minister at one time, Babu Singh Kushwaha lived in this house. He was later jailed in the NRHM scam and was also thrown out from BSP. Akhilesh Yadav's minister Rajendra Chowdhry refused to move into this house but Javed Abdi did and fell from grace of the Samajwadi Party leaders. Another minister Waqar Ahmed Shah lived here but soon developed NS Qa moved to the hospital; in a state of comma. Some staff members claim that something about this house is not good. Ït is eerie if you stay here in the night", says one of them. Situated in the posh VIP area and with the neighbourhood as influential as the state's CM, this house has remained vacant in most regimes. One of the ageing peons posted in this house feels it is haunted. "It could be a former minister who does not want to leave this house even after leaving this world", he says with a chuckle. But Yogi's minister Baghel wants to prove all this wrong. Lucknow: A photo recently became viral in social media. 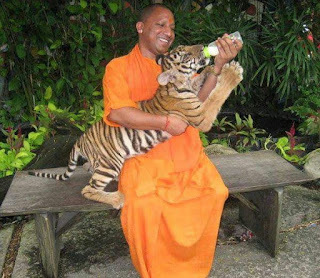 Its an old photo which shows Yogi Adityanath feeding a tiger cub. The cub, by now would have become a full grown tiger like Yogi has grown in stature to become UP's chief minister. But a fortnight has passed since he took over, Yogi and also BJP would be realising that ruling Uttar Pradesh after a gap of 14 years will be no less than riding a wild tiger. The initial hysteria following BJP's historic success is calming down now as saffron clad Yogi settles on the driving seat. Detractors keep questioning BJP's choice of Yogi as the CM mainly because of his aggressive hardline approach. Like all verbose politicians, Yogi in the past has shown least concern over the communal hatred his statements have caused. But apart from this nobody can question the integrity or character of this five-time MP from Gorakhpur. His lifestyle and conduct as the Mahant of the legendary Gorakshnath peeth has been exemplary. As a result, the fears and also the expectations are high. Yogi has been given two deputy CMs - state BJP president Keshav Prasad Maurya and Lucknow Mayor Dinesh Sharma. Both these leaders are of spotless background and are known to be dedicated soldiers of the BJP. The team of ministers includes the old guard, senior leaders who joined the BJP from other parties and also youngsters. Having said that Yogi and both his deputies lack the experience of even remotely administering a state as large and complex as Uttar Pradesh. From Day 1 Yogi has taken a strong stand against the corrupt, inefficient and complacent. He has promised to inquire into the shady deals, job scandals and favouritism adopted by the Akhilesh regime. But apart from the CM's statements, nothing has been done on the ground so far. Ironically the CM went into his first cabinet meeting on April 4 without any change in the bureaucratic setup of Akhilesh Yadav's Raj. The result is that most of the senior officials including the chief secretary, home secretary, DG police are wiling time as they await marching orders. The administration has been virtually on a standstill. Yogi's first two starters - licenses to butcheries and taming of street Romeos have had strong counter-reactions. The first led to a state-wide strike by raw meat sellers that led to end of business for restaurants and eateries dealing in non-vegetarian food. The decision was considered as the first pin-prick for Muslims as the meat business is mostly controlled by their community. Though Yogi's intention to put a noose around unauthorised meat business carried out in appalling unhygienic conditions was justified but like demonetisation it could have been implemented much more smoothly. Similarly, the anti-Romeo campaign was misdirected by the police to harass love-birds who were found sitting in parks, restaurants, cinema halls and malls. The operation was supposed to target street Romeos who were hounding girls in public places or schools and colleges. Instead, it turned into public lashing of youngsters by police all across the state. Policemen fleeced these love-birds of whatever they could pay off. Finally, Yogi had to clarify the purpose of this drive and issue warnings to erring policemen. But these two decisions only show a glimpse of how things could go out of hand because of haste and inexperience. Thankfully Yogi has not made any statements so far which would create a gulf in the minds of Hindus or Muslims. In fact, it is the other way round. In his first public appearance in Lucknow in a Yoga program, Yogi said that there is several similarities between Surya Namaskar and Namaz prayers. "I don't know why people divide Hindus and Muslims?" he asked. Yogi and BJP both must be realising that ruling UP will need some doing than merely statements. To make the party's presence felt in the state, Yogi will have to go that extra mile and learn from the mistakes of the past regimes. He will have hardly any room to commit his own. The Modi-Amit Shah formula for UP will face the first test in 2019, which is not as far as it seems.